Take a tram ride through Zion Canyon on the closed Zion Canyon Scenic Drive this summer. 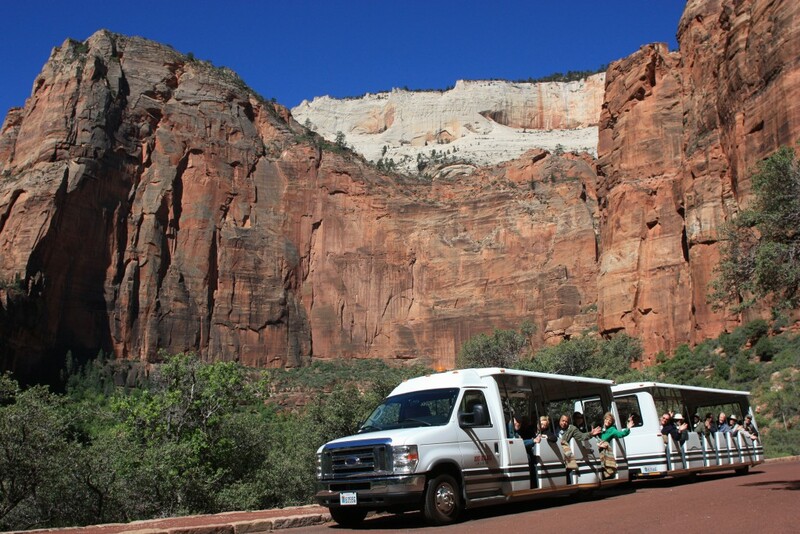 With soaring canyon walls on both sides and the Virgin River running parallel this drive, which is closed to private vehicles during the busy summer months from April through October, will take you to some of the most treasured spots in the park. Trams depart from the bus stop in front of Zion Lodge and travel north to the Temple of Sinawava with a scheduled stop at the Great White Throne. These 60-75 minute rides offer local knowledge, incredible open-air visibility and personal headsets. It’s the perfect way to enhance your visit and learn more about the park. The tram may be limited on what days it operates, so be sure to check the schedule close to your arrival to see if it might be an added experience for you. Tram rides can be enjoyed from early spring through fall. Please note that trams operate on Wednesdays and Fridays in the month of April before transitioning to a 3-day schedule beginning May 1, 2017. Tickets can be purchased at the front desk upon arrival.